Junior Paul Mulcahy and senior William Yarbrough each contributed 20 points in a 69-54 win over Hillsborough last night. 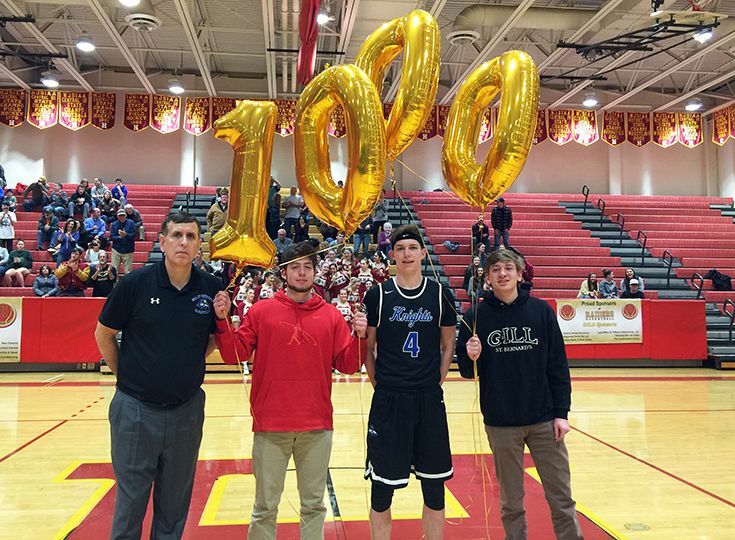 The victory marked a milestone for Mulcahy, who notched his 1,000th point with the Knights in the opening minutes of the game. Rounding out the offense were sophomore Will Soucie with 15 points, senior Alex Schnachne with 10 points and 10 assists, and senior John Yoss with 7 points. The victory brought the team, currently leading the conference division, to 15-3 for the season. Next Tuesday, the #3 ranked Knights face Immaculata on the road. Join the Knights at home on Thursday, February 8, for a triple header against Franklin High. Varsity teams will be celebrating senior night, and the Booster Club is hosting a Knights Café featuring Cold Stone Creamery. In addition, the Booster Club will be holding a bake sale and spirit wear sale to raise funds for a new automatic defibrillator. See you there.